Here are 2 special-purpose USB keyboards from Logitech that might interest a group of device users. Product Information: The Logitech K310 is a durable keyboard that’s easy to clean and dry. 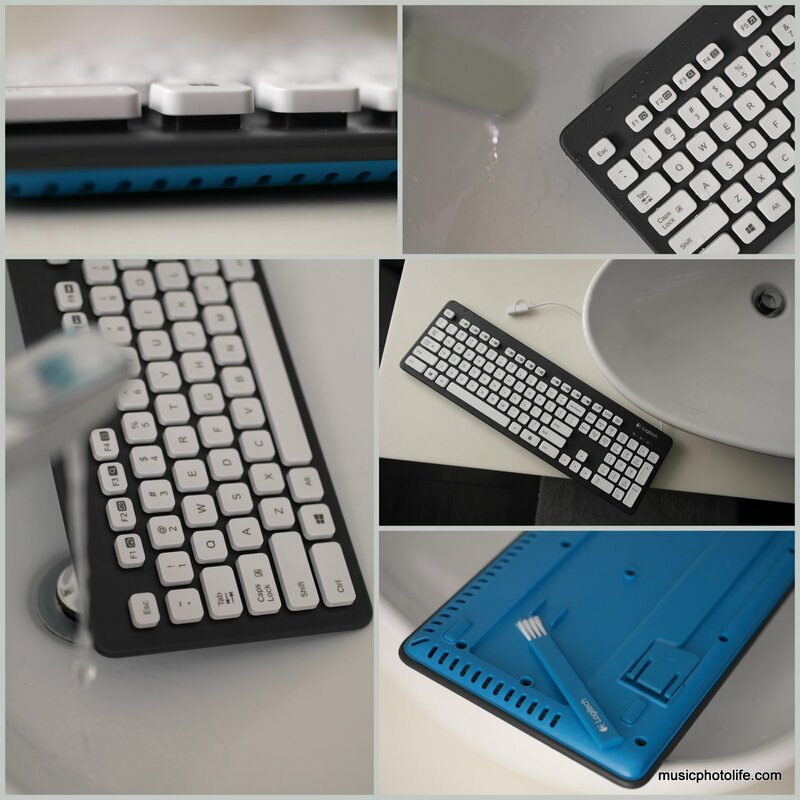 It can be submerged in approximately 30cm of water (more than any ordinary spillage) and has drainage holes at the back of the keyboard to allow for easy drying. Even after multiple washes, the characters on the keyboard would not fade as they are laser-printed and UV coated to ensure its durability. The familiar layout of the F-keys and number pad is designed in a sleek manner, giving it a contemporary look that ensures your keyboard looks and feels good (to type). The K310 is really easy and handy to use as there is no software to install and allows you to access your 12 most-used applications with a single keystroke. My review: There is no compromise with the K310. It contains the complete set of keys including number pad, and the key actions are responsive. I like how the key mechanism is elevated so there is no way any accidental liquid spills will get inside the keyboard. No mention about whether the keyboard can work underwater, though I suspect it could. Instructions clearly states that one should dry the keyboard before re-using. One thing is for sure: with the K310, gone were the days of keyboards that accumulate dust and bacteria in between the key grooves. And no longer do you need to throw away keyboards because it’s dirty. Product Information: The Logitech K400r lets you control your laptop without getting up from the couch thanks to the 10-meter (33 feet) wireless range. The large 3.5-inch Windows 8 compatible touchpad with multi-touch navigation makes vertical and horizontal scrolling intuitive. Setup is simple, too. You just plug the tiny Logitech Unifying receiver into a USB port – no software needed. The sleek, low-profile keys feel good and barely make a sound. And you can enjoy it all for up to a year without the hassle of changing batteries. My review: My peers who bought the earlier K400 version (that does not support Windows 8 trackpad gestures) use it mainly to hook the laptop to the TV screen and use this keyboard-and-trackpad single unit for convenience. Sad to say, the key actions are poor especially the space bar which you must hit on the centre of the bar. The keyboard layout is also cramp and so it is not possible for me to type accurately and fast. The 3.5-inch trackpad contains all the usual gestures for Windows 8, like swipe from edge, scroll, zoom, and also has shortcut buttons for for the 4 “charm” actions. But do be careful of your right little finger, as it might touch the trackpad and move your cursor. Despite the above unfavourable comments, this is one keyboard that you should get if you are operating Android-based TV boxes with USB port. I tried on my “no-brand” TV Box, inserted the Unifying USB receiver to the USB port, and the keyboard works instantly. Most shortcut buttons works, like volume, playback controls, “home” button, and even the on-off button. The trackpad also works beautifully, including 2-finger swipe gestures. In short, the K400r is best used as a single-unit keyboard-trackpad to operate your Windows or Android devices in a comfortable laid-back setting. And for the price, it will serve its target segment well.